Avoid the car if there is blue smoke coming from the exhaust or if the engine is too noisy. Rust around the rear wheel wells is common. A small rust spot can be repaired, but major rust should be avoided. See if the struts and shock absorbers look dry. 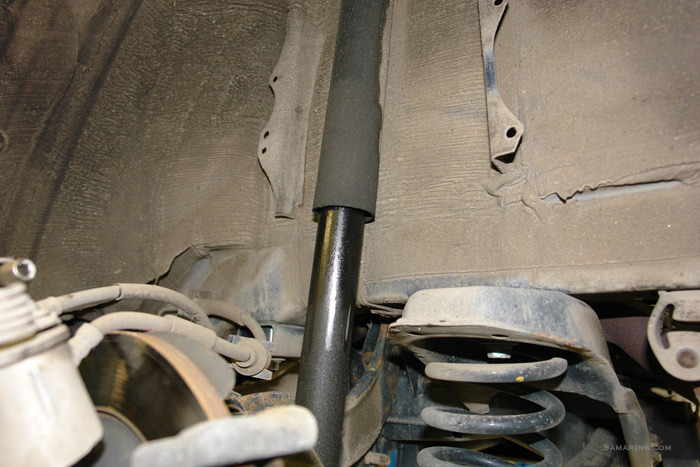 A leaking strut or shock absorber needs to be replaced. Check the air conditioner. During the test drive, see if the car drives straight and doesn't drift. See if the transmission shifts smoothly. Avoid a car if the "AT" or "Check Engine" light is on, as some problems could be expensive to repair. A failed TCM (Transmission Control Module) can cause a transmission to jerk and "AT" and "Check Engine" light to come on. The part is expensive. Watch out for tire noise; if not rotated regularly, rear tires tend to wear unevenly, which may result in a noisy ride. If the engine vibration is felt with the shifter in Drive, the top engine mount is could be bad, although it's not very expensive. 'Bouncy' ride: Rear shock absorbers can leak causing the rear end of the car to feel 'loose' and bouncy on bumps. Replacing rear shock absorbers is easy and not very expensive ($130-$170 per side). Front struts can leak too. Replacing front struts is a bit more expensive: $250-400 per side. The wheel alignment must be performed after a front strut is replaced. Vibration in 'Drive': Vibration from the engine that is more noticeable at idle with the transmission in Drive could be caused by a bad top engine mount. This part is very common to fail. Replacing the top engine mount could cost $160-$230. 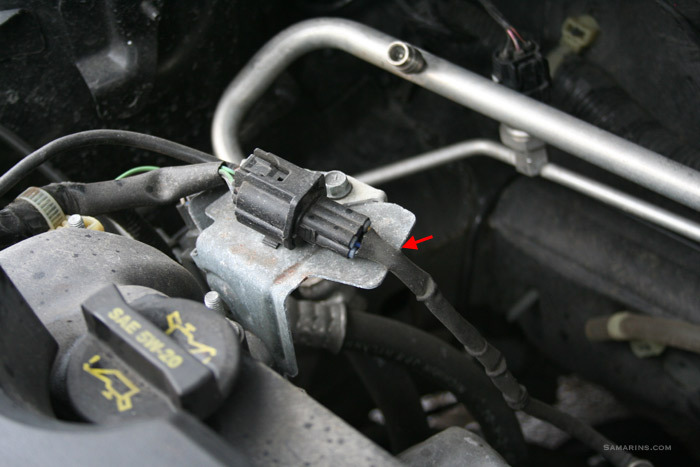 Car doesn't start in Park but starts in Neutral: This issue could be caused by rust at the lever where the shifter cable connects to the transmission (front lower part of the transmission). The repair is very simple and inexpensive. The connection point needs to be lubricated or the lever needs to be replaced. Car won't start, the engine won't turn over: Check the battery first. If the battery is OK, a corroded connection at the starter control terminal could cause this condition. If the control wire connector is corroded, the terminal needs to be cleaned and the wire connector needs to be replaced. Check Engine light with the codes P0131 / P2251 : The Technical Service Bulletin 01-015/10 recommends checking the front air/fuel ratio harness where it rubs against the bracket. This photo shows where. 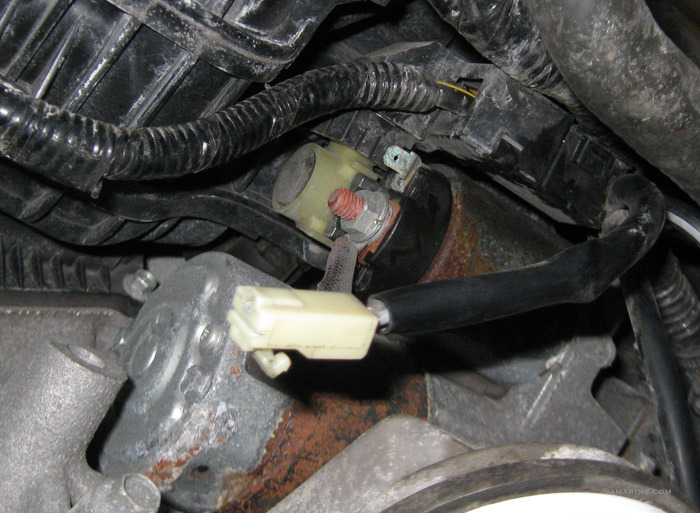 If the harness is damaged, the TSB recommends replacing the A/F sensor. The bracket needs to be bent away from the harness. 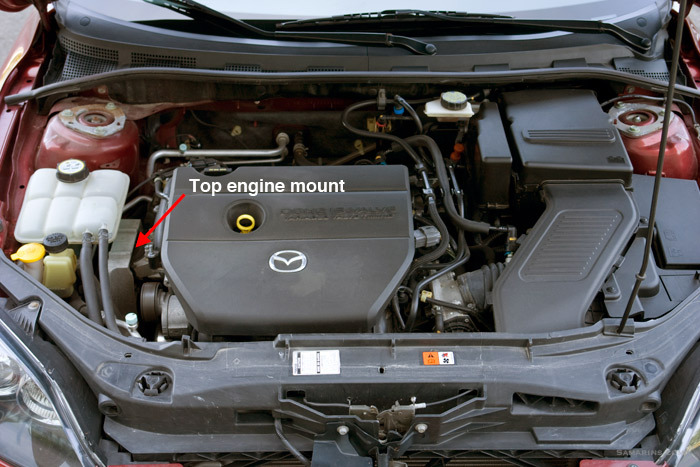 Some high-mileage Mazda 3 engines are known to consume oil. Check the oil level regularly. Change transmission fluid when it becomes dirty. 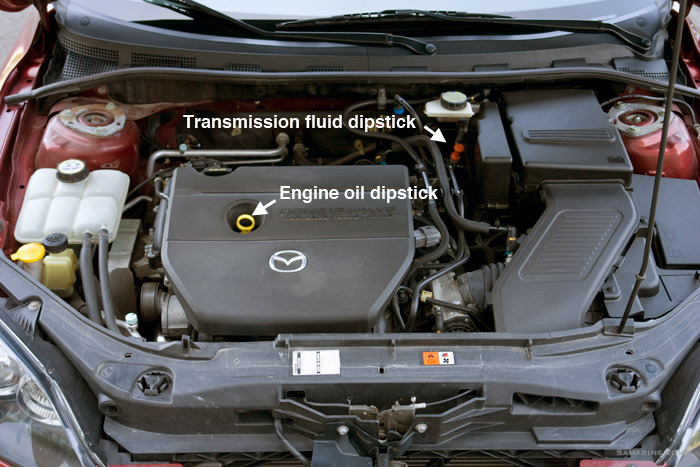 If you don't know when transmission fluid was changed last time, you can check it on the dipstick (see the photo). If it looks red and clean, it's OK; if it's dark, it's better to change it. Mazda 3 has an independent rear suspension for better handling, however with this design, the rear tires wear more on the inside. If you want your tires to last longer, rotate them often. The owner's manual for 2007 Mazda 3 recommends rotating tires every 7,500 miles (12,000 km) for normal driving conditions. Tires are rotated front to back, on the same side. Without regular rotation, rear tires often become cupped, which will result in noisy ride. Oil change, tire rotation: $45-60. Transmission fluid flush: $150-200. Drive belt replacement: $120-160. Front brakes replacement (pads and rotors): $310-430. Wheel alignment: $90-130.